1. A truck picks up the shipment at your facility. 2. The truck brings the shipment to a Premier Transload Facility in your area, where it remains for holding until you decide to ship. 3. It is then loaded into a BNSF railcar headed for Bakersfield, the destination city. 4. The BNSF railcar arrives at Bakersfield QDC, and is unloaded. It remains at our facility until you decide it is to be delivered to your customers. 5. A delivery truck arrives and is loaded for a local or regional delivery to your customer. Operating with a Premier Transloader provides customers with maximum flexibility in shipping and storage. 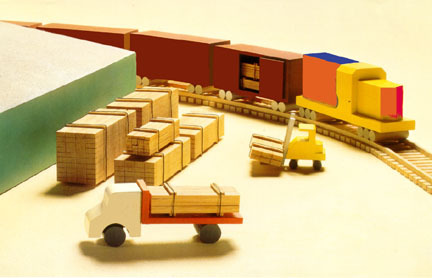 Combines the economy of rail with the timely delivery of local truck service. Eliminates costly last-minute deliveries at premium long-distance truck rates. Maintains a steady flow of product in the pipeline at low-cost rail rates. Offers complete rail service to multiple destinations and to customers with no rail sidings. Can be tailored to meet a customers special distribution needs. Offers Just-In-Time deliveries. Permits easier long-range scheduling because shipments can be warehoused locally or near your major markets.